While Irish couples have been impressing guests by getting to their wedding via planes, trains and self-driven tractors this year, one Donegal couple have taken things to the next level with their action-packed journey to the top of the aisle. 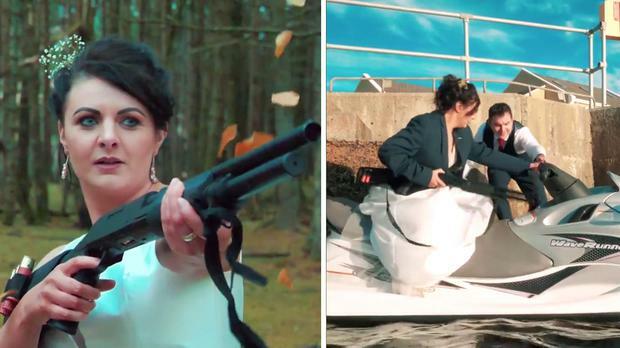 Jackie and Bernard Greene have truly upped the anti with their wedding video, produced by Re-Act Productions, which features a gun-toting bride and an RTE news bulletin that could put the heart crossways in you. As the couple's unsuspecting guests stood up to welcome the newlyweds to their reception, it's announced that the couple are nowhere to be found. As soon as guests returned to the seats however, they were greeted with a video of what the couple were really up to. The video opens on the couple in the middle of a nearby forest, having their photos taken by their pushy wedding photographer. As he snaps away however, some rather zombie-like creatures appear behind him, slowly stumbling closer and closer to the bride and groom and they become increasingly anxious. It's then that they're forced to go into all-out action mode. Karen Birney, THEVOW.ie An Irish politician received a rapturous applause at a Wicklow wedding, when he managed to surprise his new wife with a very special tribute.